A funny thing happened the other day that reminded me how grateful I am a) to have people like J.Fo. in my life, and b) to have grace in my life. I was having a slightly frazzled conversation with a few folks as I signed my bill at dinner. Suddenly I realized “oh my gosh I am tipping him the entire total. I am an idiot.” And I proceeded to scribble it out and re-total. 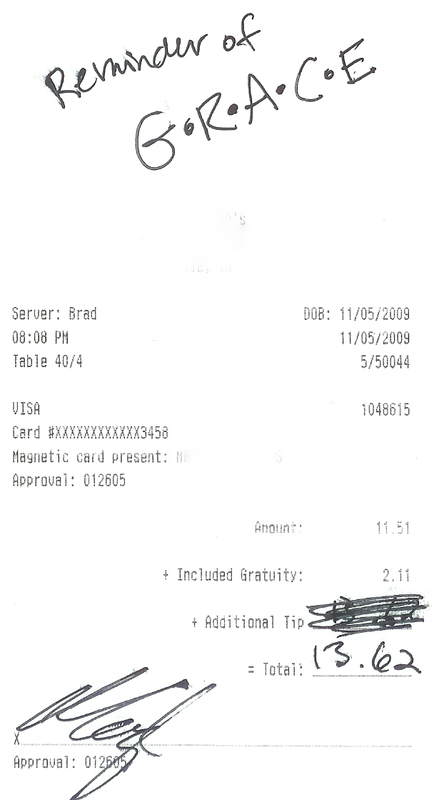 Then, as I begin to sign, I realize, “oh my gosh this isn’t even the restaurant copy,” solving my error. This is probably one of those situations where you “had to be there” but truly, we all had a good laugh for a moment. Then J.Fo. grabbed my receipt and said, “See? This is a reminder of grace.” And she proceeded to write just that on the top of the receipt, which now lives in my wallet for the indefinite future. It can be so easy to forget that everything we do or don’t do, every mistake we make, and every mistake others make are all forgiven. We have a God who loves us and loves grace–what else could we possibly ask for?